Vision Builders is our church’s sacrificial giving program where we collectively stretch to expand the vision of C3. Currently our focus is acquiring a property to be a place where people of all backgrounds and faith journeys can connect to the life found in Christ. Giving is not about equal amounts but equal sacrifice. Consider what God would have you do to take part in Vision Builders! Through the “IRRATIONAL LOVE” of C3 Toronto, we are proud to announce the purchase of a property in downtown Toronto. 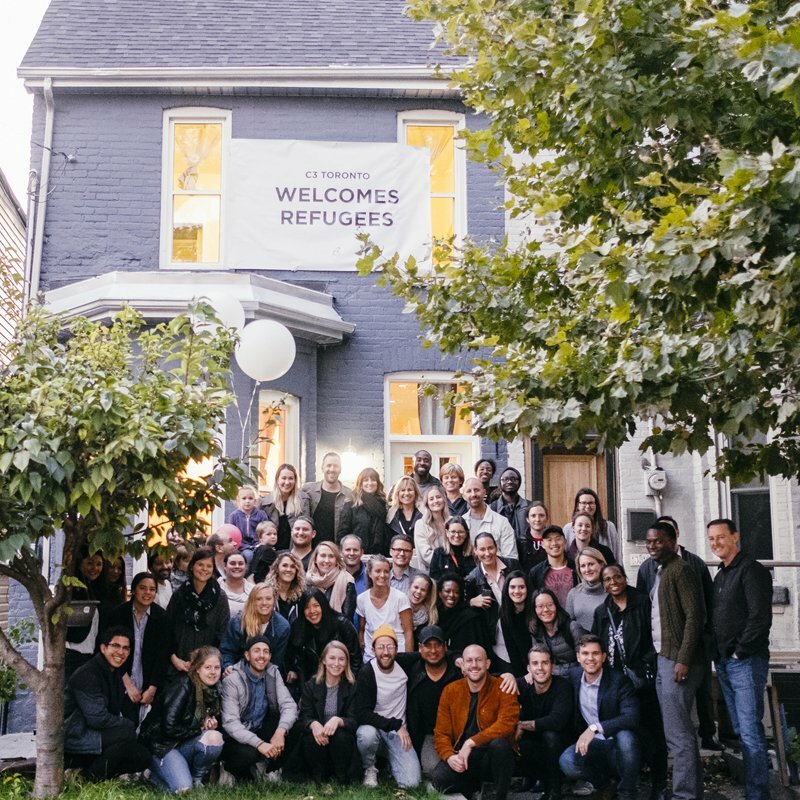 We have donated its use to Matthew House, a charity whose vision is to welcome refugees in Canada. Now there are 8 young refugees living in the house. That’s right, church!! We took this incredible step in taking ground purchasing this piece of property. After all, that is the vision of VISION BUILDERS, so why not change lives along the way?! Those warm cozy feelings of HOME for many are overshadowed by war, oppression and hate causing them to flee their homes and countries, some even leaving their family behind. Through the faithful giving of C3 Toronto we were able to put down a 65% deposit on a $800K property in downtown Toronto, and in October 2017 we handed the keys over to Matthew House for their use. In April 2018, we announced that through your faithful giving, we were able to pay the debt off in full! The story doesn’t stop there – we are continuing to give so that we can create a place of refuge in our city. Join in, there’s room for you too! HOW DO I KNOW HOW MUCH TO COMMIT? Prayerfully consider the level of giving that God is calling you to. Your decision should be based on wisdom, prayer and faith. Remember, the philosophy of Vision Builders is equal sacrifice, not equal giving. We recommend that you involve your C3 connect leader in this process. Is vision builders included on my tax receipt? All donations in excess of $2 given to Vision Builders are tax deductible. A tax receipt will be issued after the end of the financial year. Therefore, when you consider tax returns at the end of the year, the real cost of your contribution can be significantly less than the amount donated. What is the recommended method of giving? We recommend giving via pre-authorized debit or credit card. Making a regular weekly or monthly contribution is one of the most successful ways to fulfill your commitment. Simply check the P.A.D. section on your commitment card and we will contact you to set it up. Prefer to give via Auto Credit, Pre Authorized Debit or to give a one time gift (Paypal)? What if I’m having trouble fulfilling my commitment? We encourage you to make a commitment that stretches your faith, but is not super unrealistic. If you are finding it difficult we ask you to continue to seek the Lord for direction & strategy to remain financially a part of this Vision. Remember that He is bigger than our circumstances and desires to move greatly in your life. Can I give to vision builders instead of tithing (10%)? If you are in out of control debt, paying it off should be your second priority, after your tithe. Reducing the debt to a manageable amount (or even clearing it completely) should be attempted as you also make a manageable gift to Vision Builders. Remember, no amount is insignificant. All the details of your giving will be kept confidential. However if you choose to give anonymously, please be aware that you will not be able to claim tax deductibility for your giving.